Illumination Entertainment is slowly making a name for itself with its feature films. While it has made other films, including Hop, The Lorax, and its upcoming movie Sing (due out in December 2016), Illumination Entertainment’s crowning joy is the Despicable Me franchise, which (at this moment) consist of two Despicable Me movies and its spin-off Minions. Of recent years, Despicable Me 2 and Minions were surefire hits, grossing millions at the box office and fueling the need for more misadventures of Gru and his zany (but still loveable) minions. Until that time, however, Illumination Entertainment and Universal Pictures brings viewers a side detour animated feature with the movie The Secret Life of Pets. Does this film find laughs within its “secret world” premise or is it a movie that’s lost within its own animal world? In New York City, the domestic pets there have a secretive existence when their owners leave them for the day, enjoying various hobbies, food, activities, and the friendship company of the others animals. Max (Louis C.K.) is a loyal terrier dog to his owner Katie (Ellie Kemper) and has been for many years, but his reign of being the only companion to her comes to an end with the arrival of Duke (Eric Stonestreet), a massive canine who’s ready to mark his territory in his new home as the alpha dog. Competing for dominance and Katie’s affection, Max and Duke up on the street, accidentally triggering the wrath of a gang of cats, which eventually lands them in animal control cops. Locked up and heading to the pound, their travel is disrupted by fearless rabbit named Snowball (Kevin Hart) and his group of unloved animals, who share their underground realm with the pair of bewildered dogs. Back at Max and Duke’s apartment building, a feisty Pomeranian named Gidget (Jenny Slate, Max’s neighbor and secret admirer, embarks on rescue mission, seeking help from her various animal friends (along with some new ones) to bring Max and Duke home. As I am a big fan of animated movies, I have seeing (and own) almost all the Illumination Entertainment films (minus Hop). Of course, been the flagship of the company, my favorite is Despicable Me. The other two sequels (Despicable Me 2 and Minions) were good, with plenty of laughs, but the original Despicable Me was the best. 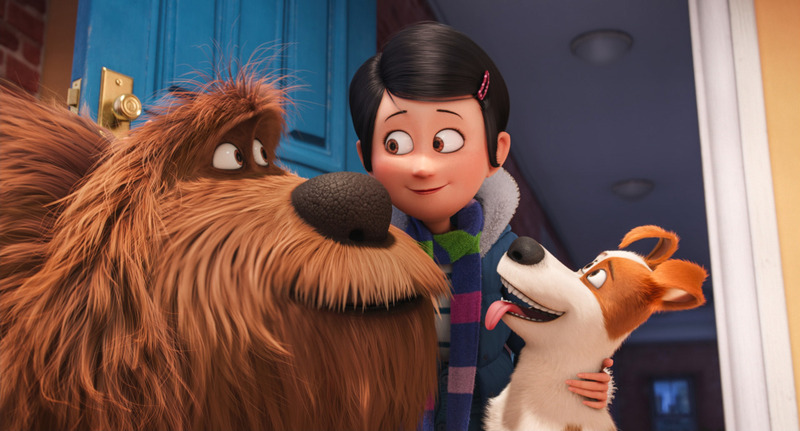 While Despicable Me 3 is still in-development, Illumination Entertainment decided to create a new animated features to its bodywork, coming in the form of The Secret Life of Pets. I for one like this idea, for when I saw the multiple trailers for the movie, I died laughing. Also, like I said, I’m a fan of animated movies. Therefore, it’s a forgone conclusion that I was pretty eager to see this movie when it came out in theaters. Now, after seeing the movie, I was satisfied in what I saw as The Secret Life of Pets, while not as exalted compared to some of the animated greats, is still a loveable movie with plenty animal mischief and laughs along the way. The Secret Life of Pets is actually co-directed by Chris Renaud and Yarrow Cheney. Both directors keep the narrative playful and airy, with plenty of time to create furry mischief as well as telling the main story at hand. The story itself is cute, fun, and definitely heartwarming. Basically, if you’re a pet owner / lover, you’ll definitely like this movie. Even if that’s not the case, the movie does have an endearing quality, especially in its comedy department. Animation-wise, the movie looks gorgeous with an abundant of bright colors that quite literally pop out on-screen. The animation style fits similar to other Illumination Entertainment cartoon films, with lush background settings and less-proportionate humans / characters. Still, its great animation compared to some cheaper-looking animated movies out there. Like a lot of animated movies, there’s plenty of humor to be found in The Secret Life of Pets. Jokes and gags come fast and furious in the feature, serving plenty of slapstick moments that (in a way) are in similar fashion to a Looney Tunes-style or playing sight-gags to how animals behave, but in a more humorous way. While it’s not generally sophisticated or anything like that, the humor in The Secret Life is quite funny and highly enjoyable, great for the kids and the kids in all of us. As a side-note, there’s a couple of Illumination Entertainment Easter Eggs in the movie, some that harken to previous movies and also to a future feature). While heartwarming and charming, The Secret Life of Pets does falter at times. Of course, the film’s biggest comparison comes in the form of its narration, drawing a similar thread towards Pixar’s Toy Story. Penned by Ken Daurio, Cinco Paul and Brian Lynch, the film’s script does indeed shares a similar structure to the Pixar classic. Both films showcase a “secret world” within our world (that humans don’t know about), but also carries itself in the same fashion with its overall themes and lessons to be learned. There’s a good lesson to be learned in the movie, but it doesn’t go deep enough like Toy Story or even its two sequels (Toy Story 2 and 3) did. There’s one particular scene I thought the movie was going to hit a particular “tender” moment, but it barely scratched the surface. In addition, the movie presents two characters that are completely different from each other (similar to how Woody and Buzz) and how they had a rivalry that ultimately becomes something more as the film’s story progresses. Even if you dismiss Toy Story premise, the pairing of two complete opposites has been told many times over, making the arc of Max and Duke’s relationship a bit predictable / formulaic. In short, The Secret Life of Pets could’ve been better if it didn’t linger so much in Toy Story’s shadow could’ve had a bit more emotional to make several scenes resonate more with its viewers. As is the growing custom with the animated movies, The Secret Life of Pets has a wide array recognizable / big name actors and actresses to bring these colorful characters to life on-screen. This proves to be a big huge draw for the movie as the voice talents are incredible, a solid casting all around from everyone. Leading the charge is Louis C.K and Eric Stonestreet as the two main characters of the movie (Max and Duke) respectfully. C.K and Stonestreet, both known for some great comedy performances hit their marks with their characters, clashing with their opposite personalities, which great a sort of fun dynamic between the two and a focal point in the movie’s narrative thread. While Max and Duke are on their adventure, a secondary plot is centered around Max’s animal neighbor Gidget, who leads the charge to help find and rescue Max, rounding up a group of Max’s furry neighbors. Again, these characters are given life by some fine work by their counterpart voice actors, including Jenny Slate as the tenacious Pomeranian Gidget, Bobby Moynihan as the hyperactive pug Mel, Lake Bell as the indifferent, but still secretly caring tabby cat Chloe, Hannibal Buress as the sly and easy-going dachshund Buddy, Tara Strong as the tiny, but spritely parakeet Sweet Pea, and Albert Brooks as Tiberius, a red tailed hawk who struggles to his predatory urges to eat smaller prey. Being similar to Toy Story, this assemblage of side / supporting characters gets their individual moments in the spotlight and shine (thanks to their voice talents), despite their limited time on-screen. Of course, the biggest standout voice talent role comes in the form of the feisty, fast talking rabbit Snowball, voiced by Kevin Hart. Hart, known for his stand-up comedy / comedic performances, is absolutely fantastic, especially when you place his voice inside of a small adorable-looking white rabbit. While he acts as the somewhat antagonist in the movie (but in a likeable manner), Hart’s Snowball is definitely worth the price of admission, bringing plenty of laugh-out-loud moments that comedian is known for. I always said that Hart would be great if he did an animated voice and clearly I was right. Other noteworthy voice talents in The Secret Life of Pets, include Ellie Kemper as Max’s happy owner Katie, Steve Coogan as the homely street cat Ozone, Dana Carvey as the aged basset hound Pops, and even the feature’s co-director (Chris Renaud) gets in on the fun of voice acting with the character of Norman, a small guinea pig who is search of finding his home in Max’s apartment complex. Like what I said about Gidget and her cohort, these characters are given their chance to shine (especially Hart’s Snowball) and get a satisfying (if not zany) part in the movie, despite some getting smaller parts than others. Get ready to find out what your pets do when you’re not around in the film The Secret Life of Pets. Duo directors Renaud and Cheney deliver a colorful world of animals that’s quite humorous for both kids and adults. While it doesn’t break the mold of a standard animated movie and shares a similar narrative beat towards one of the greater animated films (Toy Story), this movie does make a solid entry for hilarious madcap animated feature, complete several memorable characters, a spot-on voice acting cast, and healthy dose of slapstick cartoon humorous fun. To me, I actually liked the movie. Sure, it had its problems, but it was still quite enjoyable. Here’s to hope that we see The Secret Life of Pets 2 in the near future or (at the very least) an animated short that proceeds another Illumination Entertainment movie. For now, though, The Secret Life of Pets is a great kids’ movie that surely won’t disappointment, even if you’re an animal lover or not. Nice that you liked the movie! I was a little sceptic in the beginning but now I’m sure I’m going to at least watch it. Looking forward to hearing Kevin Harts role!! Haha….thanks for checking out my review. Yeah, Kevin Hart was excellent as Snowball. You should, at the very least, see the movie because he’s in it (or rather voicing a character). Yeah right, it’s a huge reason why I’m going to see it! Nice review. It’s an okay movie, but when Pixar is literally winning every time, it’s hard not to compare. Haha…your right about that my friend. Pixar usually does win. Thanks for writing!